Tsukiore hot spring Takimi- no-yu is an old hot spring in the upstream of the waterfall of Fukuroda. 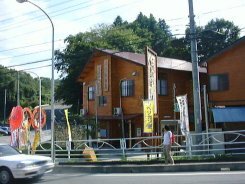 It is in the foot of a Tsukiore mountain and the national highway which continues to the Daigo-cho center part passes. The residents of the Daigo-cho Ogose district have managed this hot spring in cooperation. It is said that residents also built the building of the log-house style in cooperation. The name of the people who contributed construction capital also now has decorated the wall. According to the hot spring analysis table, the nature of the water of a hot spring is an alkaline simple spring. Fountainhead temperature is 40.1 centigrades. There are an open-air bath and a main bath. Hot water is carried out entirely. It is the temperature in which anyone is soaking long time. From the open-air bath, a hill at the back is visible. It seems that this hot spring is locally famous. The next door of a hot spring has the building of a dining-room. Demonstration of work of buckwheat noodles was done here. Since it was likely to be delicious, we ate buckwheat noodles. It is a remarkable large serving. The taste of buckwheat is deep and is delicious buckwheat noodles. Get down by Naka IC of the Joban expressway, and go the national highway of No. 349 north. Turn left at the Satomi-mura Inohana peak entrance, and cross a peak by the prefectural road of No. 28. Join on the national highway of No. 461 and progress about 1km. A car parking space is about 15 cars.